With World Water Day being celebrated this week, the world has acknowledged the millions of people across the globe struggling to survive a growing water crisis. 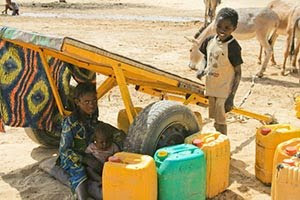 In the Azawak of West Africa, half a million people live with the daily fear of dying of thirst. In this vast region the size of Florida, young children travel as far as 30 miles round-trip looking for water. The little mud they gather is hardly enough to offer even a glass of the liquid to each of their family members. For this reason, one out of two children die before they reach age five, most from dehydration. Ariane Kirtley, a Yale University graduate, came upon this region in 2005 while conducting public health research as a Fulbright scholar. At this time, she met families that had spent up to eight years digging wells over 300 feet deep, without ever reaching a drop of water. She interviewed mothers that begged, “Please help bring us water. Our children are dying of thirst”. What impressed Ariane even more than the dire living conditions was the fact that no other organization worked to help bring year-round sustainable sources of water to the land. As an answer to the populations’ plea, she founded Amman Imman: Water is Life to drill borehole wells that each provide sustainable, abundant, and pure water for up to 25,000 people and animals. In February 2010, Amman Imman: Water is Life drilled its most recent borehole – the Montessori Well of Love, financed by Montessori students worldwide -- in the village of Kijigari, home to over 6,000 people. Each well drilled is an adventure of hope and inspiration. Ariane invites you to join Amman Imman and students worldwide in the Kijigari adventure as she recounts the drilling tale, and requests help to finish the borehole by May. In order to build the infrastructure that will bring the water to the surface Amman Imman must still raise $50,000. Our convoy of five rigs, equipped with drills, tubes, and all kinds of impressive machinery traveled two days from Niamey to Tahoua, then through Abalak. As the convoy barreled into Kijigari, we were generously welcomed by curious children, passers-by, and community leaders praying that construction happen safely. The rest of the day was devoted to setting up the machinery and equipment. At 5 AM the next morning, the construction site glowed from miles away while temporary light structures lit the otherwise dark and barren landscape. 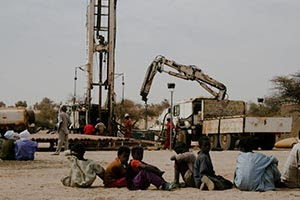 Villagers of all ages sat in anticipation while 9 meter drilling tubes were loaded onto the drill bit. Then, whoosh, drilling began. Silt and mud churned out, as the machine drilled deeper and deeper. As the dawn of the day brought the 110 degree sun to shine on Kijigari, village children crowded in glee around the drilling site. Young girls danced and sang songs giving thanks that their long trips in search for water would end, as water would soon flow in their home. The children’s exaltation was coupled late afternoon when sediment samples proved the presence of water. 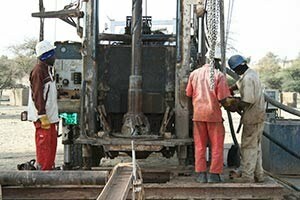 590 feet deep into the ground, initial drilling ended. Now came time to blow heavy bouts of air into the hole in order to clean it out of sediment and dirt that had fallen in during the drilling. Mud, that eventually became clearer and clearer, shot out of the borehole. As water continued spewing out into the night, one construction worker took a “shower” in the downpour for the first time in several days. Only the next day did the water come out potable. The “blowing out” procedure was followed by the pump trials, which show how much water can be pumped out of the borehole without the water level plummeting. After six hours of constant pumping, the water level hardly budged, indicating that the aquifer is bountiful. We invited villagers to fill up all their water containers and jerry cans during this process. Once the pump trials began, nomads and villagers from far and near came to fill as many containers as they could handle. Donkeys pulled wagons covered with ten or more jerry cans and barrels. Men, women and children carried up to five jerry cans, and waited patiently their turn. Women did their laundry, and children bathed in the runoff. A group of four young girls washed their hair. More children sang and danced, this time jumping in the puddles formed by the water. Even the animals drank to their heart’s content. The next day, people still traveled to the borehole hoping to fetch water, only to be turned away…. After seven hours of joy and hope in gathering water, the pumping trials, although successful, had ended. 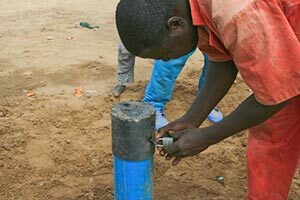 One single construction team member stood packing sand around a capped tube sticking out of the ground, the only proof of the borehole accessing water 590 feet below. A few men and children watched as he placed a lock on the tube, and handed the keys to the village chief. Who could have guessed that over the past many days, banging machinery had replaced the pounding of millet, camel yelps, and blowing wind? All impatiently await for the capped borehole to be equipped with a pump, water tower, faucets and troughs so that the water can flow abundantly for children and adults alike. The dry season has already hit the land, and Kijigari villagers have gone back to traveling 20 to 30 miles a day in 120 degree heat looking for water. Yet water lies 590 feet at the bottom of a deep pipe installed right in their village. Every day we get messages from the villagers asking when we will be able to bring the water to the surface. They are counting the time, not in months or days, but in seconds and minutes. The lives of their children lie in our hands. Pure and permanent water in Kijigari is only $50,000 away. Please be a part of fulfilling the mothers' wishes, and help raise $50,000 to bring clean and plentiful water to their thirsty children by May. Over the next two months we intend to build the water tower, pump, faucets and animal troughs - before the height of the dry season - BUT WE NEED YOUR HELP. • Become an Individual or Corporate Sponsor and offer to match the funds raised by a school. Contact info@ammanimman.org to find out how. • Join an already planned Walk for Water event and raise funds by finding sponsors. Register here at www.active.com/donate/awalkforwater as events are added. • Plan your own official A Walk For Water or Amman-a-thon Earth Day event in your community. Step-by-step guides are available. Visit www.ammanimman.org/walk to sign up. • Donate directly and/or Help in your own creative and compassionate way.